A new way to experience manufacturing simulation solutions designed with Visual Components 4.0 on mobile. 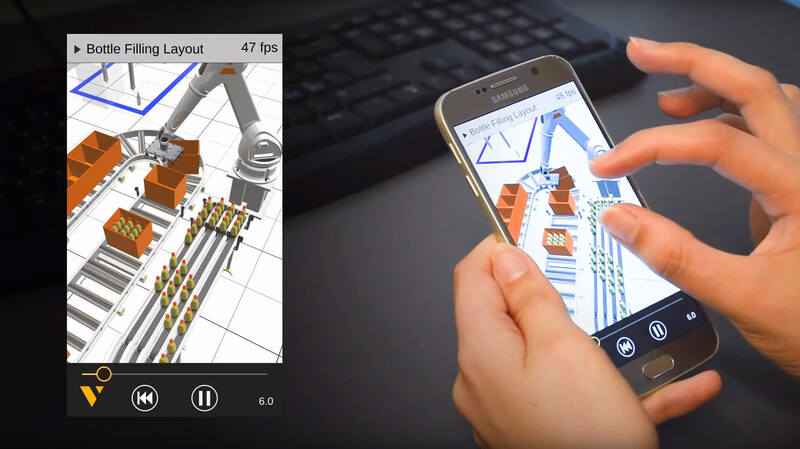 We recently launched the Visual Components Experience mobile app, which allows you to view manufacturing simulation solutions designed with Visual Components from your smartphone or tablet. Our mobile application makes it easy for manufacturing professionals to present their production layouts on-the-go and share them with their colleagues, prospects and stakeholders. Want to see how it works? Check out this video and find out how to experience your simulations on mobile! Visual Components Experience works on both iOS and Android devices and is available for free in the App Store and Google Play. Want to find out how Visual Components can help you save time, reduce costs, and improve production performance? Get a demo! Take a digital tour of our new Virtual Reality application! Checkout this video for a guided walk-through on what you can do with Visual Components in VR!